The indispensable companion to the #1 New York Times bestselling diet book The FastDiet became an instant international bestseller with a powerful, life-changing message: that it's possible to lose weight, reduce your risk of diabetes, cardiovascular disease, and cancer, all whil... read full description below. The indispensable companion to the #1 New York Times bestselling diet book The FastDiet became an instant international bestseller with a powerful, life-changing message: that it's possible to lose weight, reduce your risk of diabetes, cardiovascular disease, and cancer, all while eating what you normally eat five days a week. You simply cut your caloric intake two days a week--500 calories for women, 600 for men. But as author Dr. Michael Mosely said, It's not really fasting. It's just a break from your normal routine. This fabulous new cookbook offers over 150 carefully crafted, nutritious, low-calorie recipes to enable you to incorporate the FastDiet into your daily life. Ranging from simple breakfasts to leisurely suppers, the recipes are all expertly balanced and calorie-counted by FastDiet co-author Mimi Spencer (a devotee of the diet herself!) and nutritionist Dr. Sarah Schenker. From soups to meat dishes to delicious fish-based meals, the recipes designed to fill you up and stave off hunger--even though none are over 500 calories. There are also detailed menu plans and plenty of encouraging tips, including kitchen-cupboard essentials, the latest nutritional advice and a whole section of speedy meals for busy days. With an introduction to the diet itself--detailing its many scientifically-backed health benefits and the transformative results it's already given to hundreds of thousands of readers--this book is an essential follow-up companion guide to The FastDiet. 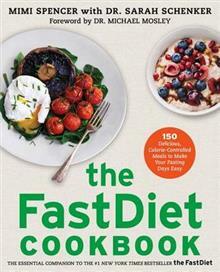 With The FastDiet Cookbook you will never have to worry about planning your Fast Days again! Mimi Spencer is a feature writer, columnist, and the author of 101 Things to Do Before You Diet. Dr. Sarah Schenker is a Registered Dietitian and Nutritionist who has served on both professional and government committees. She now combines her sports nutrition work, consulting for football clubs in the UK, with regular appearances on television and writing for scientific journals, as well as for newspapers, magazines, and websites. Dr. Michael Mosley is the #1 New York Times bestselling author of The FastDiet, FastExercise, FastLife, and The 8-Week Blood Sugar Diet, and The Clever Gut Diet. Dr. Mosley trained to be a doctor at the Royal Free Hospital in London before joining the BBC, where he spent three decades as a science journalist and executive producer. Now freelance, he is a well-known television personality and has won numerous television awards, including an RTS (Royal Television Award), and was named Medical Journalist of the Year by the British Medical Association.